Every early A-body I've owned, I've upgraded to a later dual-reservoir master cylinder even if I left the four-wheel drums in place. Everyone says if you get a leak in one circuit, you still have the other circuit working. But how much does this actually help? In my experience if one circuit fails, the brake pedal goes to the floor before building a meaningful amount of pressure in the other circuit. This is with properly adjusted drum brakes (you can just barely slide the drum on over the shoes) and working self-adjusters. You may have a marginal amount of stopping power, but it's hardly enough to slow the car down. Am I doing something wrong with the way I set up the brakes in my cars? It will often go to the floor initially, but if you pump it (repeat pedal application one or more times after it goes to the floor), you will get pressure in the other 1/2 of the system. In the old days (before discs and ABS were on everything), people used to say "pump the brakes" all the time, especially in snowy places like WI. You can help account for locking brakes, or leaking brakes, if you pump it. That is the solution in this case. That makes sense. I just need to remember that if I ever find myself in that situation again! Dual master cylinders work, i.e., they cost-effectively prevent crashes. See here. Duel circuit master cylinders have saved my bacon four times over the years. Oddly, brakes always seam to give out when stopping headed down hill. Once in early seventies with my first 67 Dart equipped with nine inch drums, two times with a Chevy 2500 van loaded down with lock smith gear, once with the LeBaron after 30+ years of no brake problems. First three were due to master cylinder blow-by, the rust free Le Baron developed a hole out of sight in brake line above fuel tank. In all cases vehicles were stoppable with extended braking distances and did not hit anything. Always purchase new not re manufactured hydrophilic brake parts, the remans are junk. I'm not arguing against the upgrade; I'm just trying to understand why my experience hasn't jived with what is supposed to happen. I've had two experiences where a hydraulic failure occurred in the front circuit and there was no apparent stopping power from the rears. After thinking about both of these a little more, I think I have a theory. Skip the next two paragraphs if you don't want the excruciating details. In both of these cases, I initially suspected the master cylinder and removed it for inspection. In both cases, the rear seal showed signs of slight leakage, but not enough to kill the front circuit (fed by the rear reservoir) by itself. The only thing I can think of is that the master cylinder in both cases had a more significant internal leak. That is, the front seal was leaking between the two reservoirs enough that when one circuit died, the other couldn't build pressure either. Both of these MCs were bought and installed before I learned my lesson on no-name hydraulic parts. The leaky racecar MC was a new Centric unit, and I can't find an email receipt for the art car MC, so it was probably a parts-store brand of some kind. Should I just chalk this up to crappy parts quality? Or is there something else I'm missing here? I've got an aluminum Doctor Diff master cylinder in the racecar now; I'm tempted to go open up a bleeder screw somewhere and see if I can build pressure on the other side. I wouldn't have thought that there was such a comprehensive report on something that seems to me a quite obvious improvement over what was there before. I like dual Master Cylinders - No reason not to use them unless complete and utter originality is the objective. On a driver car I see no reason not to make the switch. 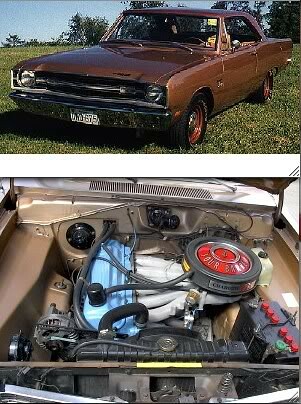 I see many pre '67 MoPars as shows etc now that are original everywhere else except for the dual pot master cylinder.